Yesterday morning I found myself standing in front of a congregation where we sang an old hymn (which I had sung before, though some of the words had been modernised) to a tune which I did not know. Someone assured me afterwards that if I had been around a certain other denomination a bit more I would have known the tune. This is actually not going to be a post about music (the alternative title gives a clue). It’s about evangelism. After the hymn incident I went on to preach about what happened when Paul took the gospel to Athens. It occupies about half of Acts 17. I have blogged earlier this year on the question that some people have raised about whether Paul made a mistake at Athens. For what it’s worth you can read it here. Here are three reflections on Paul’s evangelism in Acts that I think are highlighted in the Athens episode. Paul was not limited to one audience. Reading Acts, you come to expect that the first port of call for the apostolic evangelists would be the local synagogue. The gospel was ‘for the Jew first’ and logically it made a lot of sense to start with the Jewish community in a new city. They had the Scriptures. They knew the stories and were aware of the hopes and the promises. Evangelism meant telling them that these hopes and promises had been fulfilled in Jesus. However, while there was a synagogue at Athens, Paul did not confine himself to its Jewish congregation. In fact, he ended up speaking to a mix of idolators and representatives of a couple of different philosophical schools. He was not limited to one audience. Paul was not confined to one setting. Paul did not just talk about Jesus in the synagogue: he talked about him in the marketplace, as long as someone would listen. He talked about him in the presence of the Areopagus. Elsewhere in Acts he shares the gospel in a prison, in an audience with a government official, and in his own house. Paul was not restricted to one approach. His approach in what Luke records of his Areopagus speech is quite different from the kind of approach he tended to take in a synagogue. He still arrives at Jesus (and the resurrection), but the starting point is different and the way points are somewhat different too. There was no need to quote Greek poets in the Jewish synagogue, and his Greek audience would hardly have been overly familiar with the stories of Abraham and David. All this to suggest that Paul knew how to sing the same song (the gospel) to a different tune. Which is why we should be grateful for innovative resources, media, courses that allow the 21st century church to embrace a range of approaches, in a variety of settings, in order to reach all kinds of people. Heresy corner: would you help your church by skipping it one Sunday? Maybe you’ve heard of Back to Church Sunday. In the UK it’s scheduled for Sunday 29th and the idea is that you invite someone you know to attend your church. It’s a good idea and I’d suggest you (and your church) try it. Who knows how many people don’t come to your church because no one invites them? Speaking of people who don’t attend your church, I have another idea. It doesn’t have a website and it might sound like heresy. What about a Stay Away from Church Sunday? Before you start scrambling around for verses you think I need to be aware of, I am aware of Acts 2 and how the new believers were committed to seeking God together and committed to sharing life together. And I know about Acts 20 and the disciples coming together to break bread. And Hebrews 10:25 with its warning about neglecting to meet together. But what about having a Sunday morning where you skip the service? (You can always make it up on Sunday night or at the midweek meeting). No matter how many people gather in your church on Sunday morning, there are plenty of people who don’t. It doesn’t cross their mind. They’ll play golf, walk the dog, take the kids to sports’ practice, drink coffee, plough their way through the Sunday papers, head out to the carvery for a bite of lunch ahead of settling down for the latest iteration of televised football’s Super Sunday. Oh, and shopping (at least when the shops open at noon. For many of us, our Sunday is different (at least some of it). We are part of the worship of God in the context of a church on a Sunday morning – and that is a good thing. Sunday morning, done well, is an opportunity for recalibration; we are reminded of what is true and important. It ought to be a priority for followers of Jesus. But while we are closeted away in our buildings, we may be quite unaware of what many of our neighbours, friends and work colleagues are doing. And we don’t stop to ask ourselves if we are doing enough to connect with them and to help connect them with the gospel. I wonder if a Stay Away Sunday might open our eyes and might help us to take a different look at a mission field that we may not really understand but that calls for fresh thinking if it is to be reached effectively. What if 3 or 4 Christians skipped church and walked prayerfully through the park with the other walkers? What if 2 or 3 sat prayerfully in a coffee shop, praying for the staff and customers? What if a couple of believers prayed their way around 18 holes of golf, all the time asking the Lord of the harvest to help them see the harvest the way he does? You can be the judge. But if it is, make sure you don’t forget the 29th. Did St Paul make a mistake in Athens? At first sight Paul’s speech to the Athenian Areopagus in Acts 17 looks like a great example of how to speak to people who don’t have a biblical worldview or an understanding of the Bible storyline. Find a point of contact; build a bridge to connect with their world; quote from some of their own poets. While at the same time managing to pack in plenty of sound information about who God actually is, where the world has come from and what its future holds in store. Looking for a model to help you evangelise post-moderns? Look no further. This is it. Not everyone who has thought and written about it thinks so. In fact, for some, Paul got it badly wrong. And when you take a second look, you notice that he really was not that successful, was he? A few people followed him and believed, but it was hardly the Day of Pentecost revisited, was it? Add to that the information Paul shares in the opening chapters of 1 Corinthians – and Corinth was the next stop on his journey, after Athens. No displays of clever wisdom, he says. Just Christ, and him crucified. Preached in the power of the Spirit. It has been suggested that Paul left some very important gaps in his Athenian speech. Where is his mention of the cross? Was he too embarrassed to mention it to a sophisticated crowd? Where are the signs and wonders? Was Paul so confident in his intellectual powers that he left out the Holy Spirit and failed to rely on his power? Would a display of signs and wonders not have shifted this stubborn crowd of philosophers and idolaters? Luke was happy to describe Paul’s initial reasoning in the synagogue as ‘preaching good news’ – see verse 18. 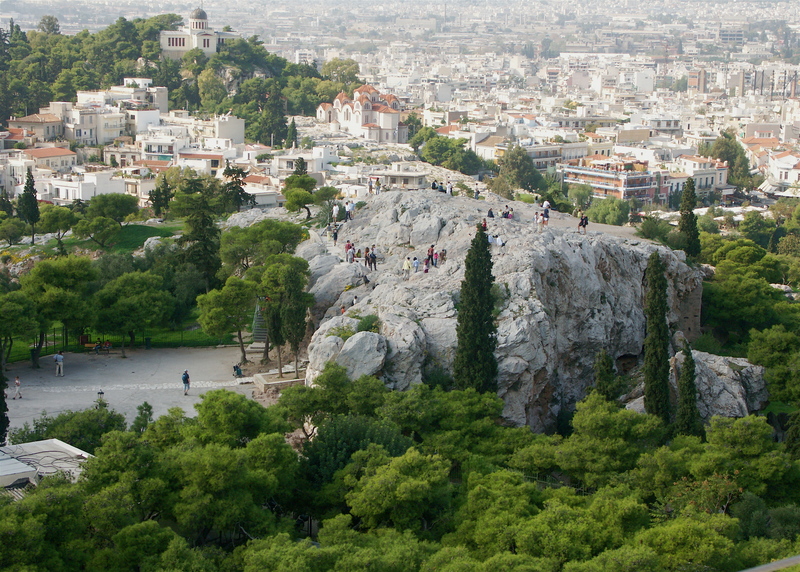 Paul preached the gospel in Athens. To read Acts 17 as a record of Paul’s grand mistake is to read something into Luke’s account that Luke himself has not put there. In fact Luke has spent a fair amount of space on his account of Paul’s speech. Would he give so much space to an example of ‘how not to do this’ without so much as a comment? The only way anyone would read this differently is to read 1 Corinthians back into Acts 17. It is better to look for a reason for Paul’s description of his Corinthian preaching in the immediate context of 1 Corinthians itself. In the opening chapters there Paul is addressing a problem where church members are elevating one speaker above another. Boasting in men (3:21) is futile in the face of a God who dismisses human wisdom as foolish. If this context makes sense of what Paul says about his preaching, there is no need to try to make connections with an alleged mistake in Athens. Clearly a proportion of Paul’s audience in Athens thought that Paul’s preaching was ‘foolishness’. His speech to the Areopagus then can hardly be construed as a display of clever oratory that wooed the masses. Although he was happy to make use of Greek poets, there is nothing unorthodox about the theology of Paul’s message: a self-sufficient, sovereign Creator-God whose resurrection is evidence of his coming reign. Paul’s later gospel communication continued to receive mixed results. As he talked with the Jewish visitors to his house in Rome (Acts 28), testifying about the Kingdom of God and trying to convince them about Jesus, the results were not too dissimilar. So what do you think? Did Paul make a mistake, or is this, in fact a superb example of contextualised evangelistic preaching? Let those who know tell those who don’t! The abbot of a monastery called a novice into his office and instructed him to give the sermon at the next morning’s chapel. The next day was almost an exact repeat of the day before. All the brothers sat there before him. His hands shook. His knees knocked. His voice trembled. Long pause. “Do you know what I’m going to say?” he asked. Well, after the previous day’s experience, they had a pretty good idea. So all of their heads nodded yes. After three days of this, about half of them had a pretty good idea and they nodded their heads yes. The other half noticed the switch from day to day, and they weren’t sure what to expect, and so they shook their heads no.